How much is Discourse based off other community platforms? I was just wondering how much inspiration Discourse took out of other community platforms. How many different platforms did Discourse take inspiration out of and how many of Discourse’s features were based off an existing feature in a community platform that Discourse’s core devs used to work at (such as a site called Stack Exchange)? I’ve been an avid forum user for a long time. I still read the Something Awful forums every day, and I registered there 15 years ago. Before @codinghorror and I got down to it, I already had a lot of ideas of what I wanted to do. Most of them came from my frustrations with SA’s forums (which by the way have NOT improved!). Jeff had his own list of grievances. I didn’t work at Stack Exchange, so personally nothing was influenced for me by that particular site. San Francisco Community Managers presents Jeff Atwood to discuss online community management and the future of forums. 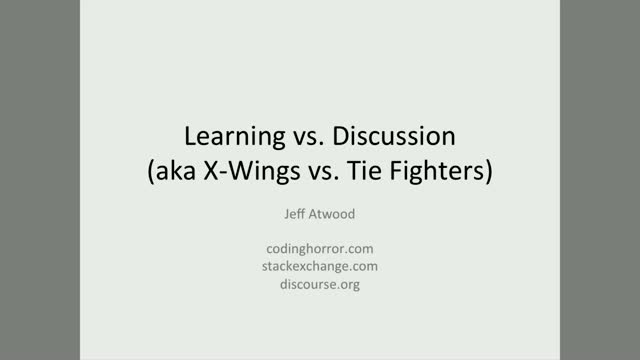 In this Heavybit Speaker Series talk, Jeff offers lessons from his experience building Stack Overflow, Stack Exchange, and most recently, Discourse. His talk also focuses on the importance of user feedback in designing a better product experience. In his second Heavybit Speaker Series presentation, Jeff Atwood shares valuable insights gained from building Discourse. Discourse is a modern forum tool designed to help users have meaningful conversations with one another on the web. … which are logical sequels to that presentation.